This is a duplex apartment with first and upper floor levels. The first floor contains an open plan lounge\kitchen, a double bedroom, bathroom, and spacious terrace. The upper floor contains a master bedroom with balcony, a further double bedroom and a bathroom. The property also benefits from a communal swimming pool, beautifully kept gardens, and a dedicated underground parking space. It is only 4 mins walk to the Burriana beachfront and less 15 mins walk to Nerja town centre. Malaga airport is under 50 mins drive away. We are very proud of our holiday home which is used by us when vacant throughout the season. We have enjoyed many holidays on the Costa Del Sol but after visiting Nerja we decided this was where we would like to buy. Our apartment has everything you would need to enable you to just take hand luggage to cut down on airline costs, hairdryers, irons, towels etc. Beach towels provided upon request. We always wanted a place in the sun and close to the sea. We looked all over the Costa del Sol and chose Nerja as it represented an ideal balance between holiday facilities, a traditional Spanish town and a cosmopolitan atmosphere. We are within easy walking distance to the beach which has many bars and restaurants, also it is an easy walk into the old town with an extensive choice of bars and restaurants or just traditional spanish streets to stroll around. Our property has air-conditioning, which is included in the price. It is convenient for getting around whether you have a car or not, we have an underground car parking space. 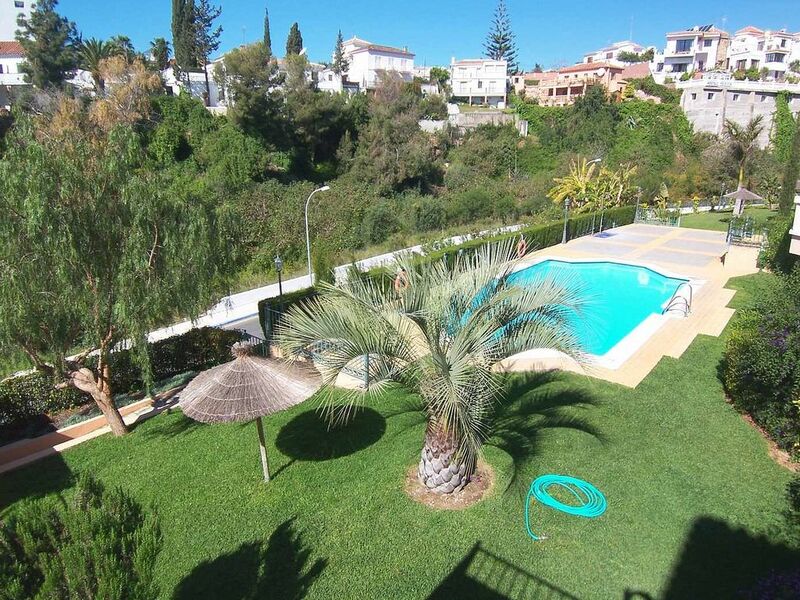 Although there is plenty to do in Nerja our property is situated on a very quiet complex and is suitable to all ages. Bathroom 1 - Upper level - fully tiled bathroom with overhead shower, hand basin, WC and bidet. Bathroom 2 - 1st floor level fully tiled bathroom with overhead shower, hand basin, WC and bidet. The living room is furnished with large leather sofa, dining table and chairs. A 42" flat screen TV, DVD, and CD player are provided as well as broadband\WiFi and a UK TV box providing all free to air channels. Patio doors lead to a spacious terrace. Fully equipped kitchen with dishwasher, washing machine, 4 ring ceramic hob, oven, fridge/freezer, microwave. Notes on accommodation: Beach towels, beach brolly, sun loungers. Outside: Jardines de Burriana has attractive gardens with a well maintained lawn area There is a communal pool with showers and sunbathing area. Underground parking. Cleaning / Towels / Linen / Maid service: The apartment is clean upon arrival and provides towels and linen. The apartment is set in lovely grounds with a shared (unheated) pool. It is ten minutes' walk from the beach and fifteen minutes from the town centre of Nerja. There is a good sized supermarket within fifteen minutes' walk. We arrived by public bus from Malaga airport very easily (and cheaply). The living space in the apartment is very ample, including a good sized balcony off the living room. We had one day of torrential rain and we easily amused ourselves watching satellite tv and playing games. There is a good wifi service too. All mod cons are in the apartment so you don't need to bring any more than hand luggage for a week's stay. Nerja is a really lovely Spanish town with plenty of good reasonably priced restaurants and great sandy beaches. We would stay in this apartment again. This property is clean, spacious and very well equipped. It is an ideal location and it is only a short walk to the beach, bars, restaurants and other facilities. I have been staying in this property for many years now and always enjoy my stay. Comfortable and clean, ideal location. The apartment is in a good location, 10 mins from the beach. The pool area is very clean and the gardens are well maintained. The amenities in the apartment are good and there is plenty of space. Overall I would recommend for families. Large apartment in beautiful grounds. Very nice, spacious apartment with a great swimming pool. Near to beach and restaurants. Good apartment, but we arrived in at 9pm to a lack of cleaning. I contacted management at this time, so the next morning the cleaning team came. A disappointing start, but we enjoyed the rest of the holiday. Very close to beach. Burriana beach is a 4 minute walk. Malaga airport is 50 minutes drive and direct bus services to Nerja are available. 15 minutes walk to Nerja town centre. Booking Notes: 30% deposit required of total price within 5 working days of booking request. Final payment required 2 months prior to arrival. Changeover Day: Flexible changeover day. Notes on prices: Prices are for the property per week in Pounds. We are willing to be flexible with prices for bookings of 1 month or more between January and March.